Pine Island, FL is a hidden gem located in the beautiful waters off Ft. Myers, FL. This mangrove island, composed mostly of palm tree nurseries, has avoided the high rise development of many areas in southwest Florida. 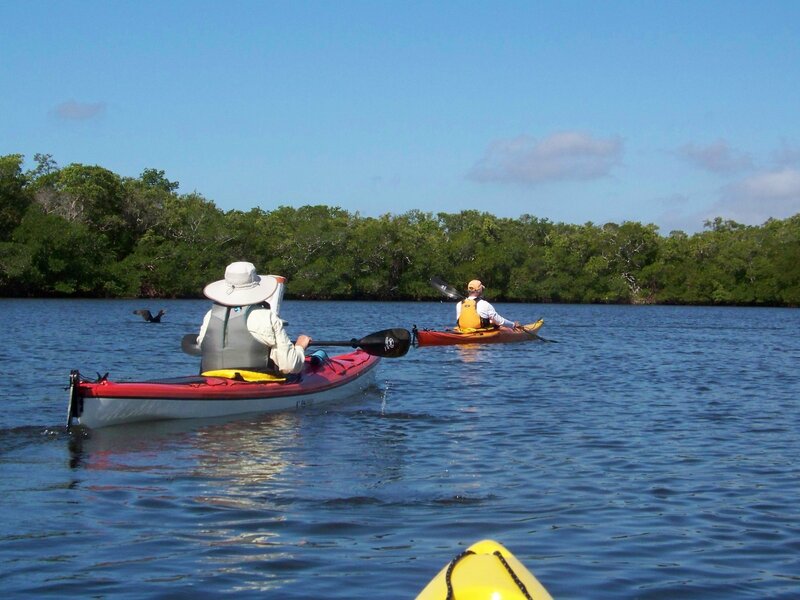 You will paddle the bays, backwaters, and shorelines of the Great Calusa Blueway paddling trail launching right from our own dock nestled in the mangroves. Your accommodations are a beautiful waterfront home with relaxing screened in porch and a bedroom and private bath for double occupancy. Greet dolphin and manatees as they visit on a regular basis. Launch kayaks and SUP's right from our own dock. Bike 17 miles of bicycle trail, visit Calusa Indian archaeological sites, plan a day ferry ride to Cayo Costa to enjoy a beautiful beach and plentiful shelling. Our itinerary will be very relaxed with plenty of time to paddle, bike, bird, fish, and explore. Paddle as often or as little as you would like...your relaxation is key to this special trip. All meals are included. Transportation to and from is your responsibility. Call us for details to make this very easy flight connection and airport shuttle to the house. If you choose to drive, it is a reasonable trip with plenty of East Coast stops to explore on your way down or back. If you have any questions, just give Liz or Steve a call at 717-252-1616. We provide touring and fishing kayaks and stand-up paddleboards plus paddles and pfd's. If you drive, you are welcome to bring your own gear. We also have 2 bicycles available to use. There is a bicycle rental shop on the island as well. $2600/Couple, Double Occupancy. Fee Includes lodging, meals, and equipment plus paddle guides.